While Delhi is full of restaurants, pubs and cafes, there are places that tend to stand out in a crowd. With its pleasant ambience and concept, Tea Trails Bistro creates an aura of tranquility in the midst of the ever bustling Connaught Place. Done up in hues of white, aqua blue and green with wooden upholstery, it is one of those rare places in CP which bespeaks comfort and has a languid demeanour. Tea Trails is a well known name in Mumbai from where the saga began in 2013. Since then the franchise has successfully opened up many branches in Hyderabad Chennai and Mumbai itself. The menu comprises of over 80 varieties of teas ranging from Green Tea, Black Tea and Herbal Tea to Tea Mocktails. The USP of this place is the use of tea leaves in their food as well. Fermented tea leaves are used as a garnishing ingredient in some of their dishes like bruschettas and salads. Another unique quality of this place is that they use whole tea leaves in preparing all their teas rather than using condensed forms like powder or tea bags. This brings out the flavor properly and the quality of the end product is not compromised. Gazpacho, a Spanish cold soup is served as a welcome drink here. Fresh cubes of tomato, black pepper and finely chopped coriander blend in to give you a taste of Spain. This was served in shot glasses. All their teas are served in an extremely organized manner with a kettle, tea cup and plate, small spoon and a Palmiers cookie (which was amazing). 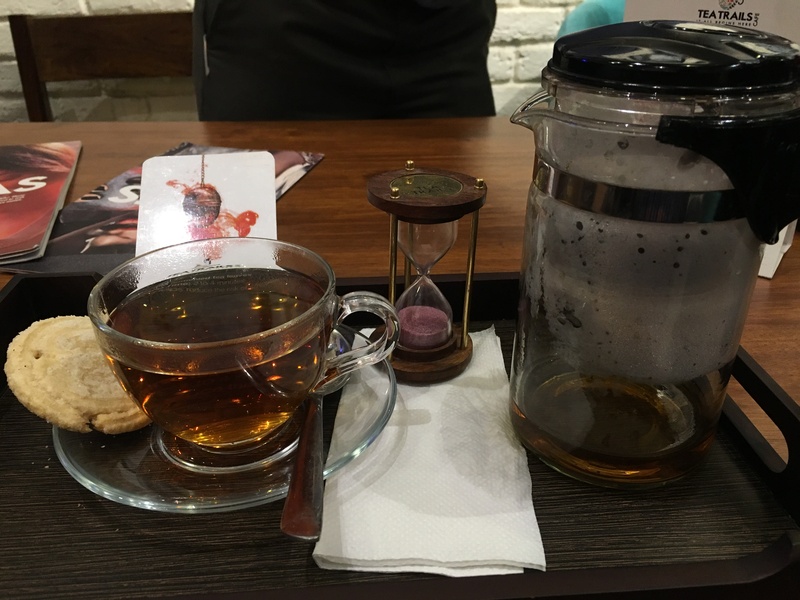 Each tray also has a sandglass as the servers explained that a good Green tea like Kehwa requires a steeping time of about 2 minutes while Black Teas require 4 minutes. In contrast to Green tea which is bland but healthy, Black tea is not very healthy but has a strong flavor. The Kehwa was good but I did not relish the Black Tea which had a distinct smoky flavor. Amongst the Chais, I tried the 5 spices chai which was definitely my favourite among all the hot variants. Made with spices like Cardamom, Cloves and Ginger, it was served in a glass cup with a Palmier cookie. Every spice made its presence felt. It would be the ideal choice for a relaxed winter evening. Amongst the cold teas, you must definitely try their Litchi Bubble tea which is like a pop of flavour in your mouth. While Sangrias are usually made with wine, Tea Trails has introduced a Tea Sangria made with herbal tea and Cranberry juice with small pieces of apple floating on the top. Gulkand Bun Maska is basically an Iranian Snack where a fruity bun is buttered with Gulkand Maska. It is light on the stomach. Eggs Kejriwal is a popular snack in Mumbai. The name comes from Mr. Daya Prasad Kejriwal who would bring a snack of Pav and Omelette to the gymkhana. A lightly fried Omelette is placed on a buttered Pav and sprinkled with finely chopped onions, green chilies and red chilli powder. It is delicious and quite filling as well. The Green Tea Bruschetta, one of their specialties is made with onions, bell peppers and fermented green tea leaves. For the health freaks there’s Burmese Tea Salad prepared with Lettuce, nuts and fermented tea leaves. It tastes best with the dressing that comes with it. Vada Pav was definitely the highlight of our meal. A fluffy vada made with boiled and mildly spiced potatoes was pressed between Pav breads smeared with green chutney. Smoked Chicken Sandwich had a distinct flavor of the barbeque sauce used for dressing the chicken. Among Desserts you have to try their Choco Chip Muffin which is quite big and mouth watering. The Dutch Truffle comes with a scoop of Vanilla Ice cream on top and the combo is delightful. Plating for both the desserts is pretty impressive. If you like to have your cuppa in solitude, Tea Trails is the place to be. Connaught place has opened up many dining options for food lovers. 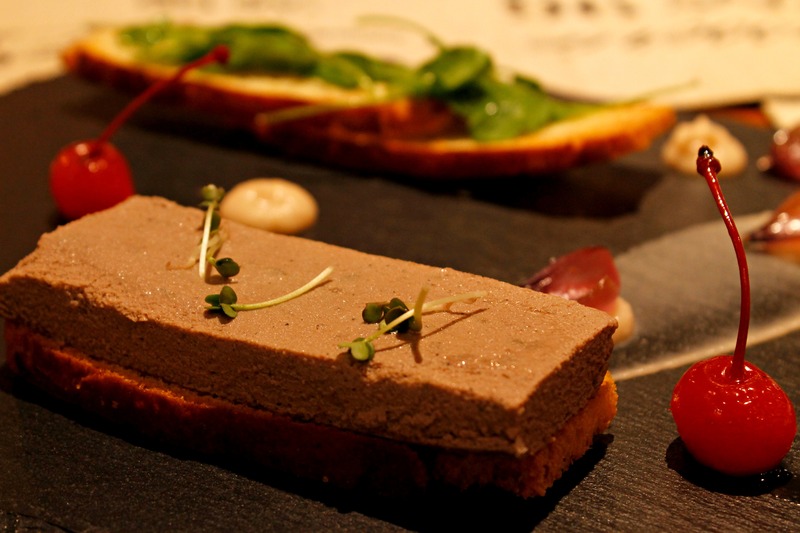 From single cuisine restaurants and cafes to international brands and pubs, CP has it all. However, Unplugged Courtyard is one place that stands apart from the cluster of eateries in its vicinity. With a huge courtyard replete with a tree and comfortable canopies and table chair arrangement, the place promises an exquisite dining experience with a beautiful décor and an expansive menu. The restaurant offers 3 kinds of seating arrangements. You could go for the dimly lit interiors that give off a party feel or the al fresco dining area, the courtyard. There is a huge tree surrounded by a parapet where you can sit and enjoy a leisurely chat with your friends. They also have a rooftop seating that opens after 6 p.m.
Unplugged Courtyard is a star when it comes to starters and drinks. They have a mind blowing range of innovative cocktails and a few of them also employ techniques of molecular gastronomy. Roji has a strong flavor of Gin and is served in a vessel traditionally used to store pickles. The drink is topped with crushed ice, litchi and Star aniseed. Ginger sour is basically Whisky Sour but shreds of Japanse Ginger-Gari are mixed with it to add a twist. The Giardino comes propped up in a lantern; vapours emanating from the bottom. Virgin Mojito was quite refreshing and served in a tall Jack and Daniels glass. Peanut butter and chocolate shake came in a goblet shaped glass and was lip smacking. 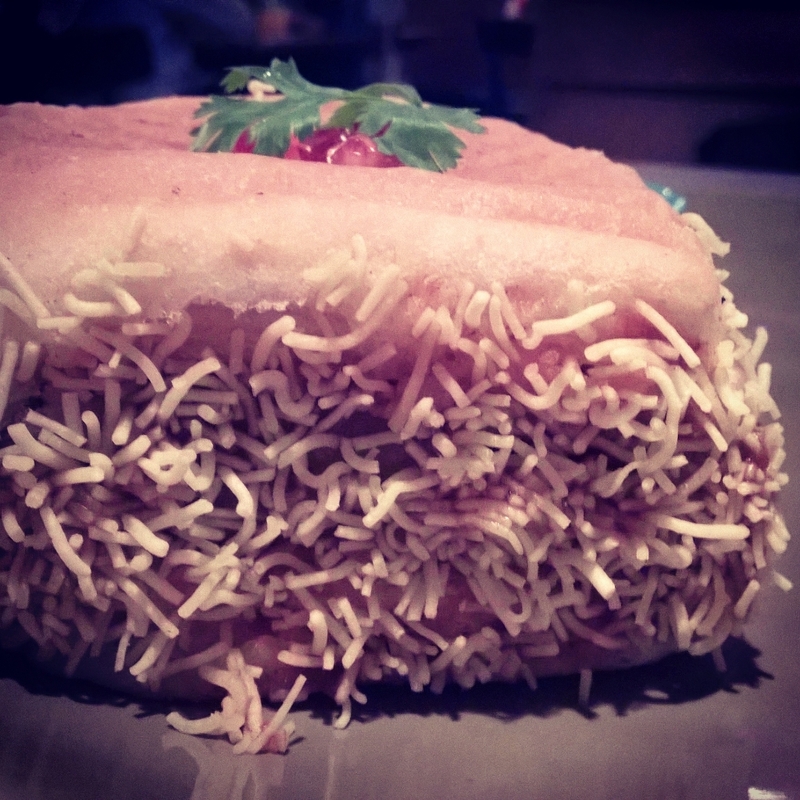 Paneer Ka Ghosla was made with Chilli Paneer in the fried ‘ghosla’ an blanketed by a cheese slice. Spring Rolls were okayish; the exterior not being crunchy enough. Red Bull Sakahari Croquettes was absolutely scrumptious. These were basically cheese rolls, batter fried and served with a syringe that held a unique concoction of Red Bull and Mayonnaise. For main course I went all Italian and ordered a Chicken Ravioli in White sauce. The dish did not meet my expectations as the Raviolli kept falling apart and the sauce could definitely have been better. Turkey Ham pizza lacked cheese and meat. For Dessert we tried Brownie Pakora with whipped cream which was completely out of the box and super delicious. But the anti grill lollies were the showstoppers. Chocolate, Kiwi abd Strawberry syrups are poured on an ice slab which maintains a temperature of -29 degrees Celsius with the help of liquid nitrogen. These are then stuck to plastics sticks on which they can be enjoyed. Unplugged Courtyard is the perfect date spot with the canopies and the perfect place for catching up with your pals over a drink. The molecular gastronomy only makes it better. It is a blessed addition to Connaught Place! In some respects, Cafe Dalal Street is the most exciting opening to hit Delhi this year. As the name suggests, the restaurant presents a unique way of serving drinks ranging from cocktails to smoothies. The price of each drink is based on a demand and supply model. The higher the demand of a drink, higher is the price and vice versa. With hundreds of cafes coming up each year, the sensex based pricing of drinks at Cafe Dalal street definitely ousts the monotony. It is not only the pricing that is different; the bar also has some unusual cocktails to offer. One of the drinks that caught my interest was The White Wine Zing Spritzer, a concoction of white wine, gin, peppers, jalapeno and strawberries. However outlandish it may sound, this drink is undeniably a treat for cocktail lovers like myself. Not to worry foodies, this place has got your interests covered too. Cafe Dalal street head Chef, Mr. Hemant Kumar has crafted an enticing multi-cuisine menu that brings an extraordinary range of finger food to the table. The idea behind the food was to give the customers a fun menu to go with the drinks and my experience was definitely amusing. I started my culinary adventure with Butter chicken golgappas, which being an original creation combines the everyday street food with north Indian all time favourite butter chicken. The traditional potato stuffing is substituted with diced chicken chunks served with tangy butter chicken curry and this appetizer is simply ambrosial. I also had the chance to try wasabi prawns and jalapeno poppers. The jalapeno poppers are stuffed with an admixture of Cheddar and Gouda cheese along with jalapenos and olives. The poppers are served with sweet and spicy salsa containing honey which gives it a unique flavour. The wasabi prawns were the right balance of crispy and soft. Even though, it is always difficult to find fresh seafood in a non-coastal city like Delhi, the prawns served at the restaurant taste incredibly fresh. The allure of this joint does not end with food and drinks. The staff is extremely amiable and alert to the needs of the customer. The ambience of the restaurant is very welcoming as well. The cafe is lit with dim orange-red light and the music is not very loud in the sitting area, working well for a perfect lunch or dinner conversation over drinks. If all this doesn’t excite you already, let me tell you that this is one of the few places in Connaught Place that also has a dance floor. Cafe Dalal Street is a place that truly gives you the 100% feeling. 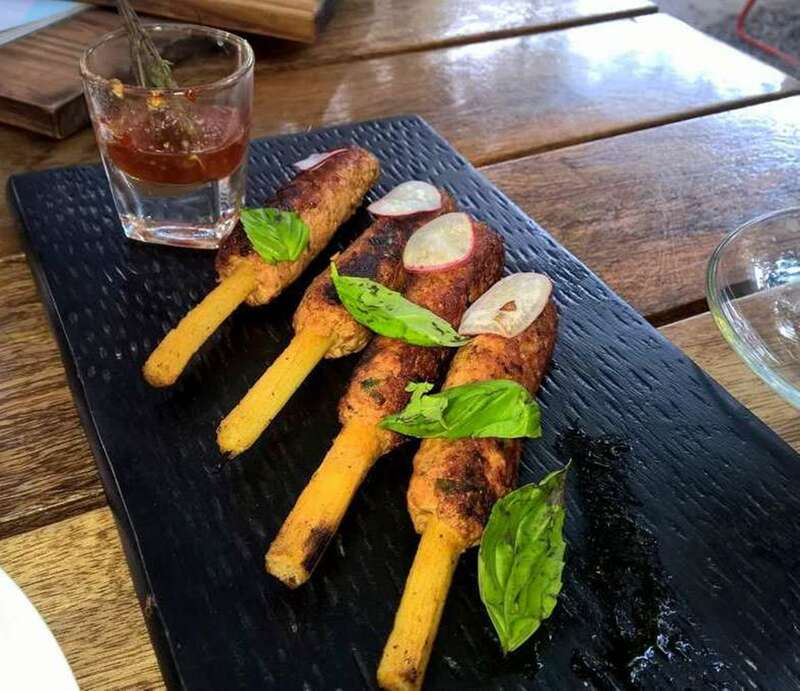 The ambience is good, the food is great and the concept is exciting and so this joint will definitely be on top of my recommendation list to anybody looking for a fun experience in Delhi. What to look out for: The new limited summer menu that includes refreshing dishes with ingredients like mango. The Cosmetics, Coffee & Snack Shop located on 22 Janpath , Indian Oil Bhavan Corridor is an institution in itself.It stands tall and proud as one of the few remaining old haunts of Dilwaalon ki Dilli. Known widely for its perfect blend of frothy cold coffee & consistency throughout the years, it has managed to withstand the big bad wolves like CCD, Costa, Barista & Starbucks. 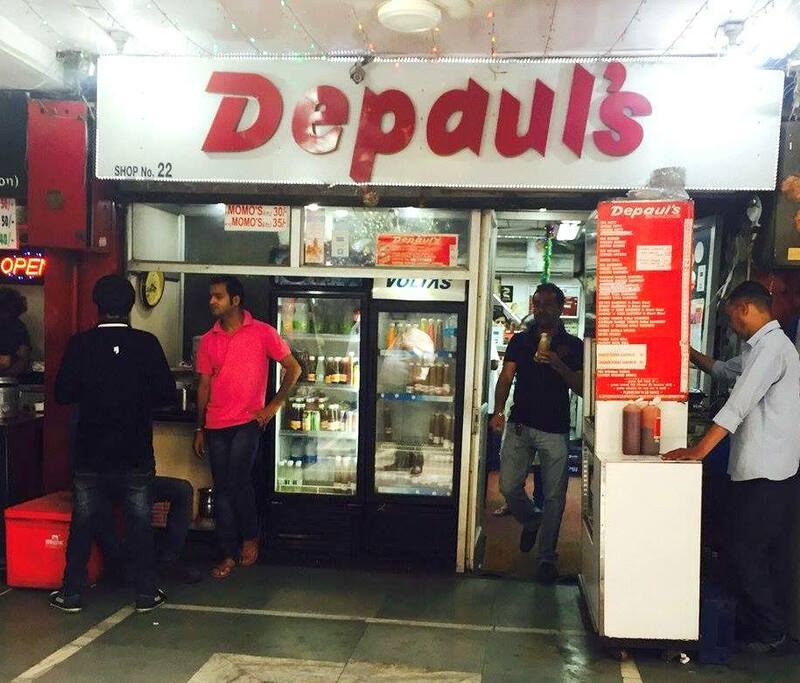 I can say with utter confidence that there does not exist any true Dilliwaala who hasn’t visited the infamous Depaul’s. The name itself is sure to stir up conversations stemming from fond memories and nostalgia between friends, students, colleagues and thinkers. Be it discussing philosophy & politics right in the middle of the capital city or whiling away time after bunking lectures to getting that much needed kick of caffeine after the endless bargaining at Janpath, Depaul’s has managed to be everyone’s first choice in the bustling market of Janpath & Connaught Place. The reason why Depaul’s has successfully continued and further strengthened its legacy is because it emits an aura of permanence & culture in an otherwise fast-paced world where producers are driven not by their craft but by their desire to be number 1. Founded in 1952 by Mister Dharam Pal Kathpalia, it was more than a distant dream. Surprisingly, hailing from a prominent family Mr. Dharam Pal never got the approval from his father on starting a business venture because his father was sceptical of “business” as a promising occupation. On having been conferred with the ‘Rai Sahab’ designation by the British Officials, he didn’t like the sight of his son leaving a possible future in administration/governance for something as risky or unstable as a business venture. 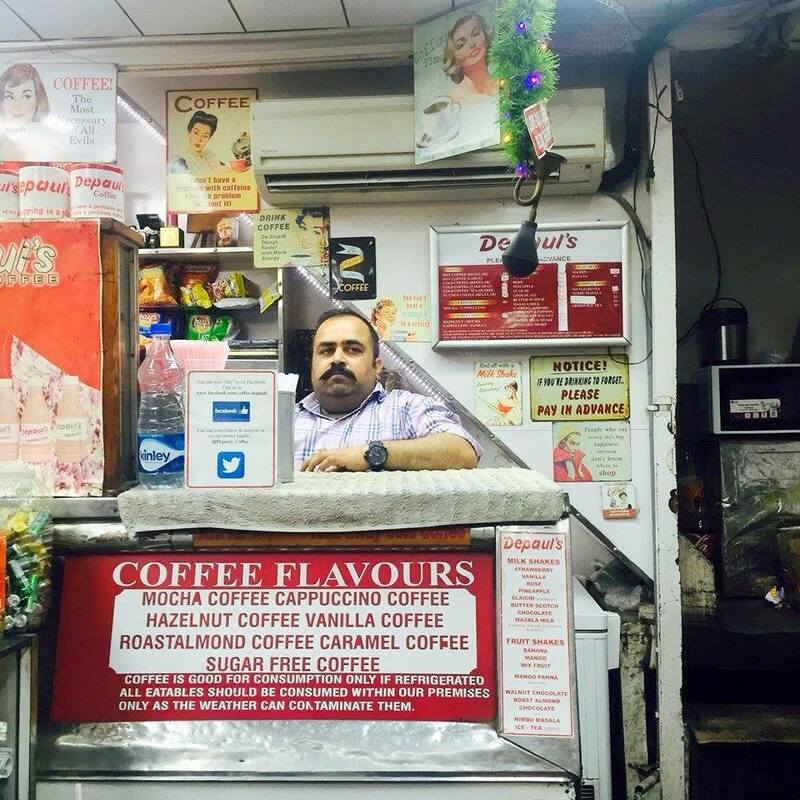 The lovely Mr. Ashwani Kathpalia; second generation of the family business who was personally attending to all his customers with a beaming smile was more than willing to share with me the history of Depaul’s and how it came into being. So, with absolutely no family support and very little money, Mr.Dharam Pal had no other alternative but to start from scratch by selling mere objects as a street vendor. Subsequently, as a result of his hard work & will power, he opened his very own cosmetics shop in the posh neighbourhood of Janpath where he was joined by his two real brothers & that’s how the family business came into being. After being relocated from the original Depaul’s which was located on the corridor along the main road to its present location in 19 70 , the enthusiastic entrepreneurs of the Kathpalia family expanded their business from a cosmetics shop to a booming beverages corner in 19 68 & that is the story behind their first ever bottle of cold coffee. A decade and a half down the line, the owners decided to further expand and transform Depaul’s to a well stocked shop with Cosmetics, Cold Coffee and a range of Food Items owing to its sheer popularity and prime location. Depaul’s now houses under its name, The Original Cosmetics Shop, Cold Coffee Corner, An elaborate Snacks Bar with Burgers, Grilled Sandwiches, Korma Sandwiches, Momo’s, Patty’s & their famous Cheese Balls. Staying true to the principle of customer satisfaction, Depaul’s has managed to keep up with the changing trends by introducing a fresh range of flavoured cold coffees. You can now order anything from a Regular bottle of Cold Coffee to Mocha/Chocolate/Hazelnut/Almond/Sugar Free Cold coffee. For all those of you who last visited this humble institution in your good old college days or those of you who are new to this beautiful city , head out to what in my opinion is a heritage coffee shop & travel back in time where the coffee is always premium and the quality is always consistent. Entering the chic interiors of Lutyens Cocktail House (LCH) at 22, Janpath, right opposite Le Meridian Hotel, brings a lot of promise of a luxurious dining experience. In a space set away from the bustling inner circles of Connaught Place where restaurants and cafes are fighting it out in a constant battle to win over palates, LCH is strategically positioned away from this competition telling its own story of British sophistication and elegance, serving the Delhi powerhouse comfort food and a fine dining experience. Sitting with a bunch of other food reviewers on a sunny Sunday, one gets to hear stories from history that have found their narration in the designing of this dining house. Named after the British architect Sir Edwin Lutyens, the restaurant is the brainchild of Priyank Sukhija and has been created with impeccable artistic care. The big hall that the place flaunts has been studded with circular mirrors on one wall that highlights the modernity interspersed with framed plans of the architecture of the Rashtrapati Bhawan and bird’s eye view sketches of different buildings and areas designed by Lutyens. From the teak panelling to the chairs bearing a wooden radial for a back rest is a tribute to the architect’s work and speciality. The open square bar station smack dab right in the middle of the hall highlights what LCH has the best to offer ‘infused cocktails’. Having tried two out of the seven to eight bold signature cocktails from the menu, I personally found the Perfume working for me more than the Citronus. The former was a fragrant refreshment with a peach ice sorbet fused into rose wine with a hint of cardamom; the sweet heaviness of the wine that needed light whirring brought a cooling sweetness to it as the sorbet melted into the drink. The latter, however, was a tangy beverage with a sharp prick of vodka overridden by an overpowering infusion of syrupy orange candy and mace, garnished with lemongrass. Chic and minimal hanging glass fixtures and sunlight filtering through massive windows run the length of one wall overlooking one of the most posh areas in the heart of Delhi. They prepare this place not only for a sober brunch or formal luncheon during the light of the day but also add playfulness to the place in the evenings making it a fun bar and a venue for flamboyant cocktail parties. Visiting the place late in the morning, I opted to taste the special brunch menu. Eggs Benedict was my first order which is prepared by adding an egg in a cup to a pot of hot water and some vinegar. The poached egg is then put aloft a thick slice of crispy and sweet English muffin or bread, and topped with Hollandaise sauce that seeps right through the sponge, giving it a buttery and creamy texture throughout. The brilliance of the dish is in the simplicity of the taste, although Eggs Benedict is bound to leave you unsatisfied if you do not accompany it with a salad or a side dish. A bowl of Caesar salad that had been ordered by me earlier tempted me to be tried out along with it. The salad had less crunchy leaves of romaine and iceberg lettuce than I expected, with meagre shavings of Parmesan cheese underdressed by olive oil. With an exotic music selection ranging from Spanish vocals being strummed to the guitar to Middle Eastern tunes lurking softly in the background, I waited rather long for my dishes to come and longed for the manager or the chef to accompany me on this visit and tell me more about the preparations, the unique techniques to make them if any, and why they tried certain textures and aromas together, one of them being mushroom risotto which hits you unguarded with an overwhelming, smoky, and strong flavour of mushrooms which may be unpleasant to some. Made with three kinds of mushrooms, namely button, porcini, and shitake, the stock prepared with the latter two seemed to be less flavoursome than the mushrooms themselves, and the rice undercooked. To try out another similar recipe I ordered beetroot risotto which was a cheerfully red and pink steaming preparation garnished with roasted beetroot pieces, asparagus, and a crispy beetroot cracker, which added a crunch to the well cooked Arborio rice. It was a great treat that left me craving for more. The next dish that I tried was a sweet pancake with fresh cream and sliced bananas topped with icing, which was pretty leathery and dry while chewing and one would expect a more generous helping of cream with it. Following this, I tried chicken pancakes. The chunks of chicken were a bit hard to chew and were prepared simply with almost no spices, and hence lacked aroma while keeping its flavours light for brunch. The servings were enough for one to fill his or her stomach comfortably during that time of the day. Right before the dessert course, my eyes caught the Lutyens pie in the menu which proved to be a wonderful last minute decision. The dish comprised of a marinated paprika chicken leg snuggled in a bowl with a layer of tastefully salted and roasted potato mash. The flavour of garlic and a lingering presence of cheese added to the pasty texture of the mash. 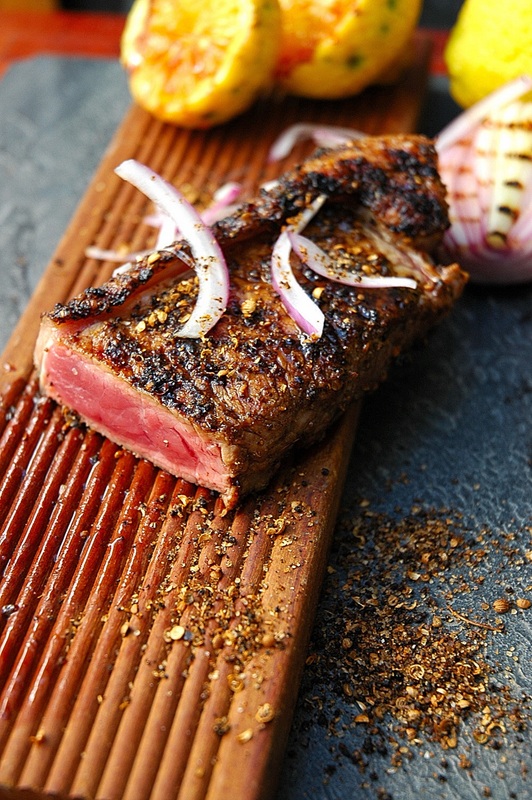 It also magically aided me to savour the extremely well-cooked, soft and delicious meat. I would personally suggest a drink with the dish, not because of any dryness in the meat but rather to round up the experience this pie brings. The desserts to my surprise were a winning bet, freshly prepared at their bakery in The Warehouse and not bought or ordered from other bakeries or makers. The banoffee cheesecake was a creamy and dense delight with a layer of walnuts accompanied with the rich flavour of coffee, caramelized bananas, and balanced by a finishing of toffee sauce and cherry. It is one of the best preparations in the menu as one can have to put a perfect end to the dining as it has this quality of making one feel of having indulged themselves. The tiramisu also proves itself to be one of the winners as it leaves your taste buds craving for more. The deliciously moist sponge adorned by a rich layer of cream was truly delectable, hiding away a tucked layer of coffee-flavoured cream. 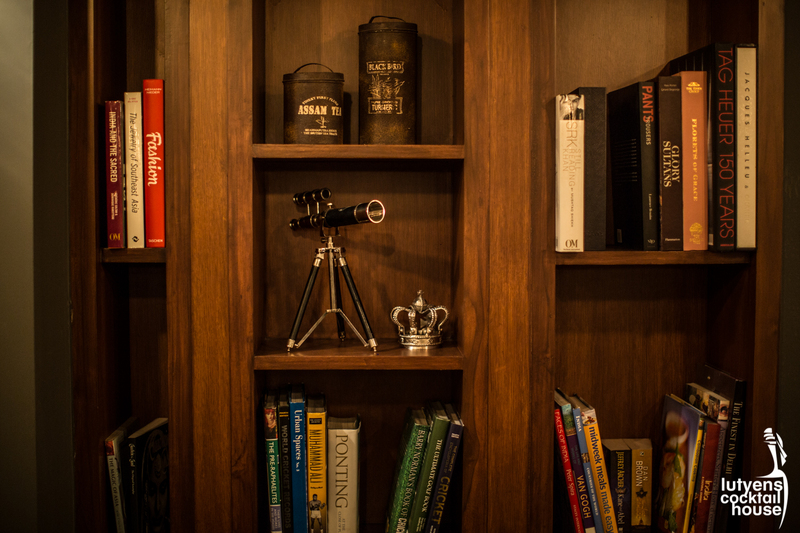 Wrapping up the brunch, I took another look around the place which was adorned with coffee table books and travel guides; picturesque and pleasant to look at with its old clocks and miniature models of iconic cars. Remembering my LCH culinary journey on Robert Welsh cutlery, I set off wondering that although appetising, the food lacked recall value. With the brilliance and boldness that it shows in its desserts and cocktails respectively, LCH needs to adopt the same style in order to be able to improve its shortcomings in culinary preparations as well as the efficiency of its general services. I seem to have grown interest in posting my food updates even more so on Instagram recently, and I did so the night I went for the review at The Embassy Restaurant. It received more than a hundred likes in less than an hour thanks to the truly delectable royal food that it serves. Before I start describing how delicious the dinner was, I think it is important to throw some light on its history. In 1947, India got its independence. A year later in 1948, two gentlemen, P.N. Malhotra and G.K. Ghai who arrived to Lutyen’s Delhi from Karachi, decided to set up one of the most iconic restaurants in the heart of the capital. It happened to become the city’s iconic gastronomic and intellectual hotspot. The royalty of this place, however, is still apparent. I have witnessed people bonding over food here. People bonded over love, some in the sphere of business, and some in politics. This place even had regulars who put “9.30 a.m. to 11.00 a.m. Embassy Restaurant” on their visiting cards. And the legacy continues even today. The restaurant is currently managed and run by the third generation – Kumar Savar Malhotra. In August 2014, there was a disastrous fire that gutted the interiors of the restaurant. After a short break, the restaurant was back again with its flaring new interiors blending effortlessly into the existing architecture of Connaught Place. I have been there many times before, usually during the mornings to try different dishes on the menu, especially the king-sized chana and vegetable samosa. I was present there for dinner this time. There is no doubt that the menu is quite extensive and I, therefore, asked the chef to suggest some of their signature dishes. On the table, were three of their non-vegetarian signature starters – roasted chicken, bharwa tangri, and chicken malai tikka. All of them were excellent in taste. The roasted chicken was first marinated in hung curd and aromatic spices, and was later roasted to perfection. The chicken was juicy and tender. Marination seemed to be just right and spices evenly spread. Bharwa tangri kebab was stuffed with minced chicken, cheese, onion, garlic, spices and coriander leaves, later roasted in tandoor. This kebab was completely flavourful and I literally went drooling over it! Next in line were the embassy’s specialties from the main course section. I was accompanied by a vegetarian friend who commented that the dal makhani was extremely delicious. She accorded the same to its strong clove flavour and yes, the chef’s recipe as well. Achari paneer was another dish that makes this place truly different from others. This dish was nicely flavored, quite spicy but the use of kalonji seeds seems to have given it a slightly bitter taste. Chicken masala, dal meat, tomato fish and chicken steak were some of the other signature dishes here at the Embassy. 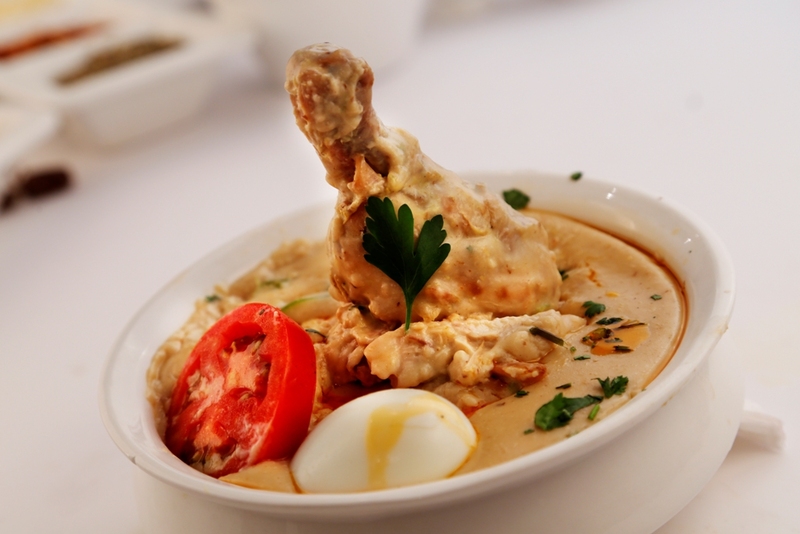 Unlike the red gravy in which chicken is usually cooked, the chicken masala, here, was cooked in a rich cream and almond sauce tempered just right with red chillies. This dish also had a slight sweet taste. However, I was quite disappointed to taste dal meat – lamb chunks cooked with lentils. 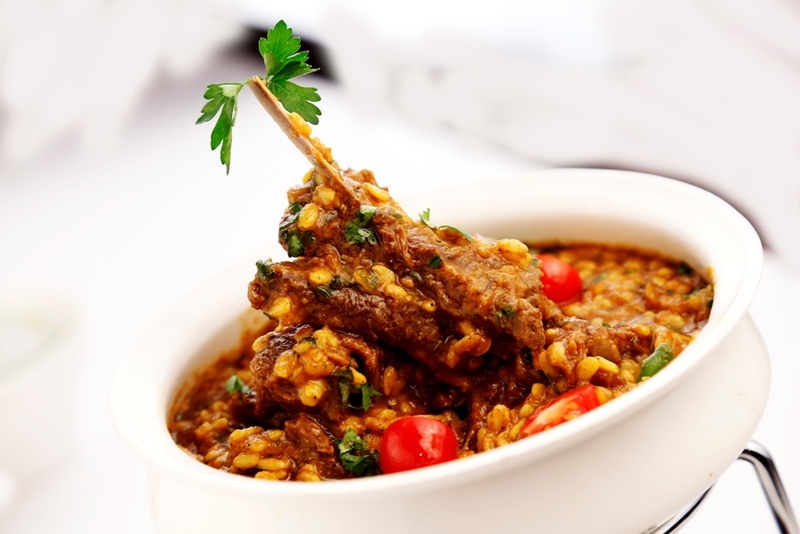 This dish is basically a mix of boiled yellow lentils (moong dhuli) and mutton rogan josh. I found the lamb chunks to be quite dry and a bit chewy for me. However, the gravy was absolutely delectable. 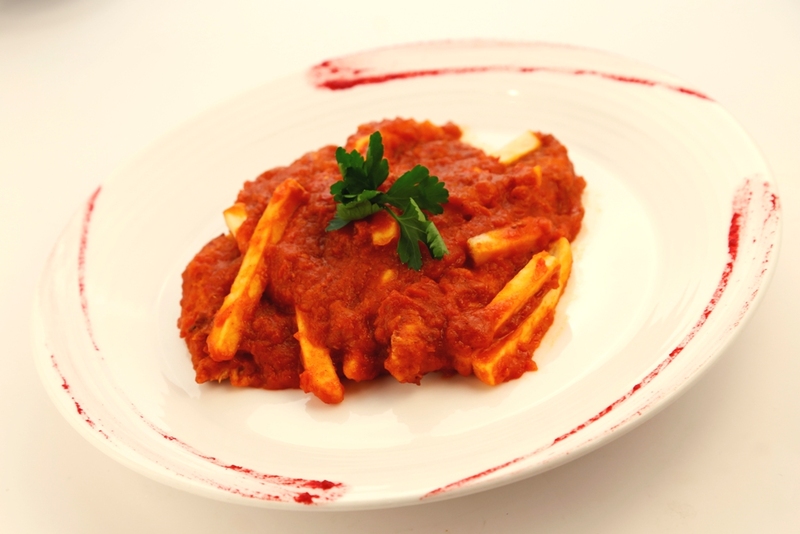 Yet another iconic dish of this place is tomato fish – sole fillet topped with their own tomato concasse sauce. It is said that when Savar took over the reins of the restaurant, he tried twisting the tomato fish slightly by serving it with French fries. The reaction they received from their clients was that of total rejection. The loyalists were equivocal in their view and the restaurant then had to come back to its original version. I rounded off my meal with the Embassy Pudding – soft, creamy, and with a surprise cashew element was simply a treat! Tooti Fruittee was another delicious mix of refreshing fruits and nuts. May the legacy of good food continue! 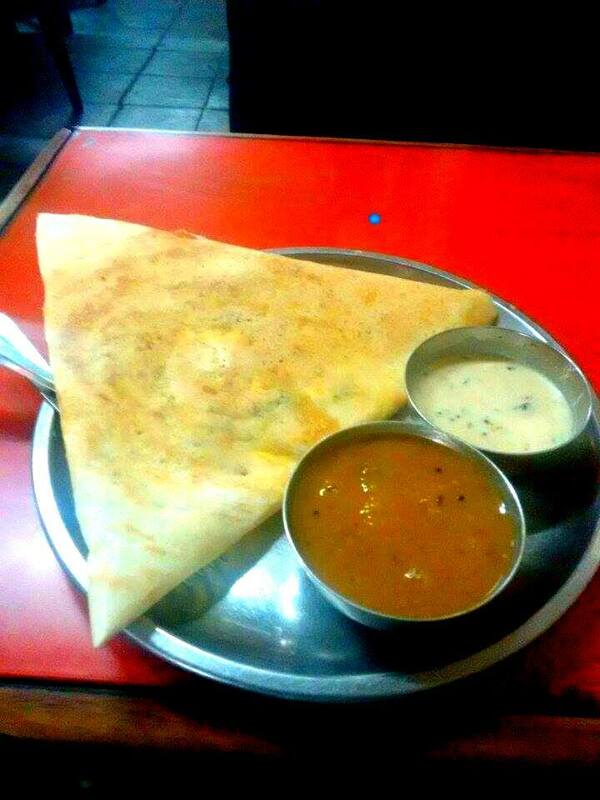 The Madras Coffee house, located in the Outer circle of Cannaught Place is much more than what meets the eye. I say this because the Madras Coffee House has been able to successfully withstand money-making corporations and multi-national food chains and stand tall& proud as one of the oldest café’s/restaurants/hotels in the capital city. 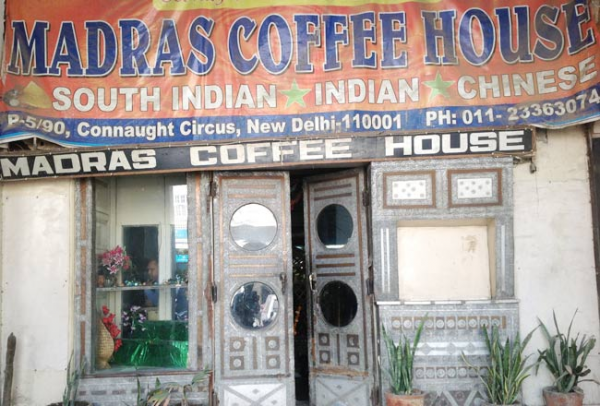 The offers keep coming, but the dedicated and loyal workforce of this humble and charming little café is true to its cause of protecting what seems to be, one of the very few remaining haunts of Old Delhi.This coffee house is a legacy in itself because of its rich historical background and cultural importance. It emits a strong sense of pride and loyalty which is why the owner feels that in a couple of years, the Madras Coffee House will be considered as a heritage landmark. It was initially a modest ice-cream parlour which was owned by the Hem Chand Jain family who moved from Punjab to Delhi. Like any farsighted business man, he expanded his shop into a restaurant and bar called the Shanghai Restaurant and bar which was a popular haunt for the British soldiers who brought over their lady friends, danced with them within the pasty white walls on band music, ordered Chinese food and sipped on their cocktails. Owing to the supremacy of the British crown and the strong pertinent racial bias, Indians were not allowed in this restaurant even though the owner was an Indian national. The owner frowns when he speaks of this, but that’s just how things were back in British India. Post-independence, the restaurant was changed once again into a pure vegetarian milk bar, called Respo Bar &once again, Indians were welcomed with open arms. Owing to its prime location and popularity, Jain transformed it into a fully functional coffee house in the 1950’s and that is how the Madras Coffee House came into being. On entering this coffee house, you are immediately transported back in time. The windows are covered with plastic flowers hanging down, there is a temple with an idol at the entrance of this coffee house which is surrounded almost as if it is under guard, by a structure of bamboo. The ambience of this place is sure to make you nostalgic. The pale off-white walls running across the coffee house, covered with broad panels of metal engravings are met with dark orange tables and modest wooden chairs covered with an olive green fabric. The entire place is exactly how it was in the 1950’s. There is a huge backdrop of Kwality Walls Ice-cream posters behind the counter and an ice-cream parlour that is no longer functional. It’s a typical coffee house with music playing in the back, crowded with college students, middle aged professionals and the odd 1-2 foreigners. 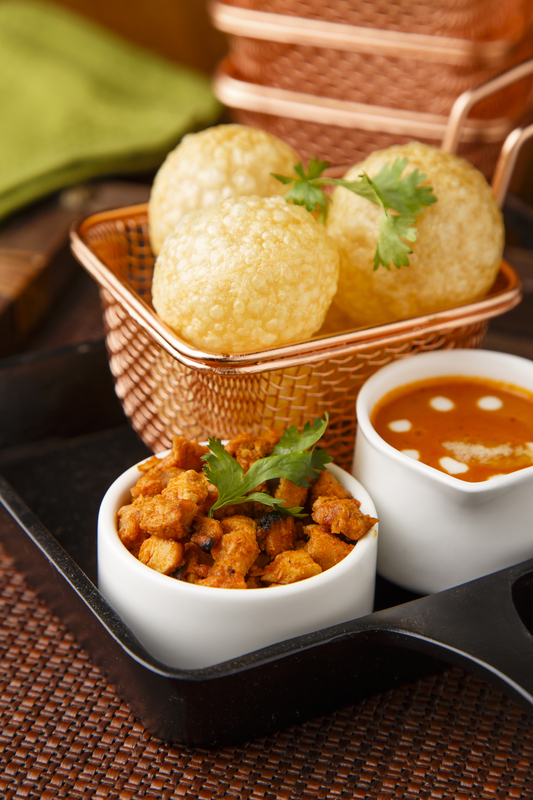 The menu is diverse with a wide array of dishes spread across Indian, Chinese and South Indian. The infamous filter coffee, the airy-light Idli’s and the delicious Special Masala Dosa were my favourites from the menu. The filter coffee was made just like any typical south Indian filter coffee served with a sugar pot. The Idli’s were soft and airy, accompanied by an authentic rendition of the coconut chutney & spicy Sambar, the special masala Dosa was a combination of well-boiled potatoes, curry leaves, cottage cheese, peanuts, fried onions and tomatoes.Dining in the Madras Coffee House was an experience in itself with soft, soothing music playing in the background, students and professions reading their books and the manager, waiters bringing in food with utmost simplicity and joy. So, if you’re ever wandering the streets of Cannaught place or looking for a taste of real Delhi, don’t forget to check out the Madras Coffee House and be transported back into time with walls that tell stories of the glorious past and food that will make you come back for more. Nestled cosily in a warm corner of N Block, Connaught Place, Sbarro is set to delight all kinds of pizza lovers alike with its varied, sumptuous menu of pizzas, other Italian dishes and desserts. I recently had the opportunity to visit its most recent outlet in the National Capital Region of Delhi, and was warmly given a tour of the place by Jayant, Sbarro’s manager of marketing of the North and East regions of the country. Sbarro currently has one more outlet in HUDA City Centre, Gurgaon, which opened on the 4th of October this same year. Sbarro dates back to as far as 1956, beginning as the brainchild of Italian immigrants Genarro and Carmela Sbarro, who journeyed from Naples, Italy to New York, U.S.A. 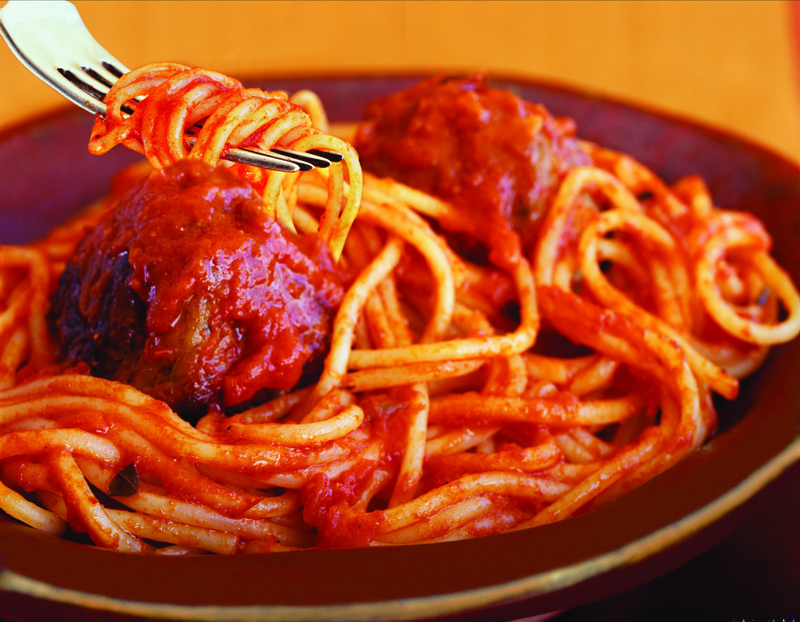 The two established their first Italian restaurant, “Salumeria”, in the locale of Brooklyn. Now, Sbarro, currently headquartered in Columbus, Ohio, is one of the leading international pizza quick serving restaurants, with a thousand outlets worldwide in more than thirty-four countries. 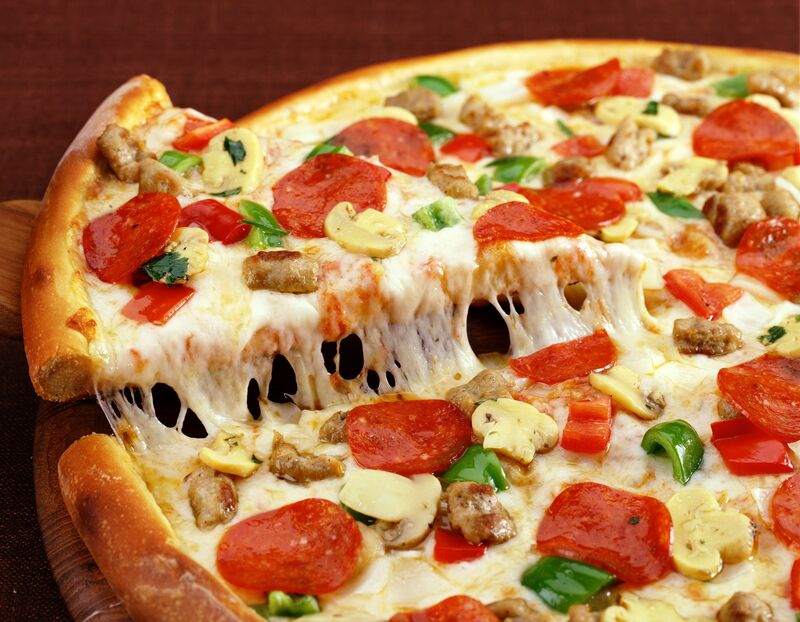 In India, Sbarro is franchised by Jyoti International Foods Private Limited, which is headed by Mr. Akhil Puri. I soon sat down with Rahul Gladwin Massey, the head chef, who wasted no time in giving me the veritable walkthrough through the elaborate menu, and little unknown interesting facts that are otherwise unknown to most. The menu, which like in all other Sbarro branches all over the world, follows 60% of the original menu with a few modifications made in order to suit the Indian palate. Such modifications include inclusion of ethnic flavours, such as tandoori and tikka, and the replacement of beef and pork by chicken in most pizza variants, the exception being pepperoni pizza. Rahul also told me that Sbarro believes that an excellent pizza must always be served fresh and piping hot, and then explained all the rigorous rules they followed to maintain this standard. 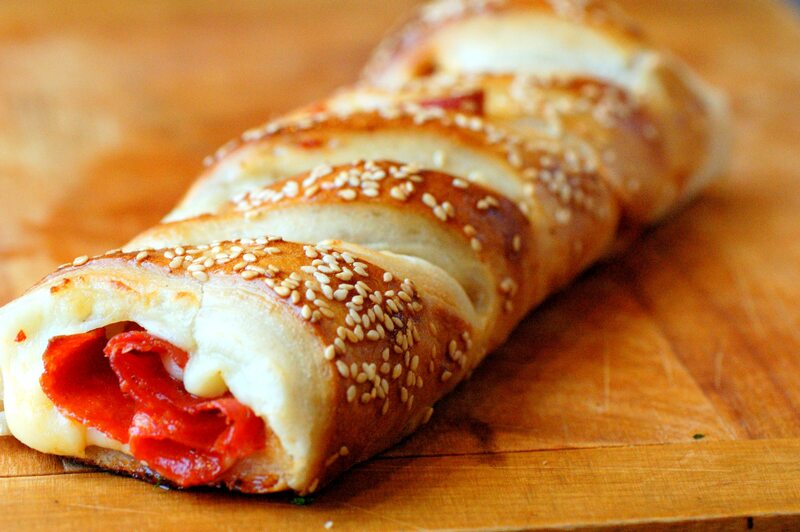 Fresh dough is made every day in the store, adhering to the strict guidelines of shelf life, as well as fresh sauce, which is manufactured from imported tomatoes. A major distinguishing feature that sets Sbarro apart is their use of 100% dairy cheese, which leads their products to have a lesser shelf life, but more flavour, as opposed to other pizza chains that use 40% dairy cheese with a mix of other chemical and cooking substitutes. The menu at this outlet has a huge range of pizza slices, with nine New York style pizzas (thin-crusted, but sturdy enough to hold its toppings; a novel way to eat it is by folding it from the middle) that Sbarro is known to specialize in, four pan pizzas (thicker crusts with more bread to appeal to the Indian user), two Chicago deep dish pizzas, eight pastas (which use both spaghetti and penne), three amazing desserts and a plethora of hot and cold beverages to deliciously wrap it up. The white pizza is an absolute must-have for the cheese lover, with ricotta and mozzarella cheese lavishly spread over a thin crust, and no tomato sauce base, making it a novel one-of-a-kind eating experience. As someone who does not have a natural affinity towards pineapple, the ham and pineapple pizza completely won me over with its perfect blend of minutely diced pineapple and ham pieces wrapped in oodles of melting cheese. A similarly themed offering to watch out for is the cheese pizza, which includes Sbarro’s signature tomato sauce blend. The mushroom olive pizza is yet another specialty one can find only at Sbarro, with cheesy slices decked heavily only with the aforementioned toppings, for the more exotic and variant pizza eater. According to Rahul, the pepperoni pizza has been a hit with the other NCR outlet as well. Other thin crust pizzas (starting from Rs. 49 onwards a slice) include chicken tikka, which has a classic Mughlai twist to it, supreme, spicy paneer, and vegetable supreme. The four pan pizzas include veggie delight, paneer supreme, super supreme, and sausage jalapeno. But what really will make you have a wholesome, stuffed-to-the-brim meal, is the new variety of stuffed pizzas Sbarro has introduced here (priced at Rs. 179 a slice, and Rs.1199 a whole pan), which includes vegetable extravaganza, paneer makhani, sausage & pepperoni, and garden style. I had the chicken makhani stuffed pizza, and needless to say, I was blown away by the seamless blend of popular Indian curry flavours and Italian herbs and spices. Next came the breads, which are bound to fill you right up and leave you rubbing your belly in satisfaction. The garlic bread (priced at Rs. 59) was freshly baked with a light garnishing of finely chopped garlic pieces on the top. Apart from this, I had the sausage & cheese stromboli (priced at Rs. 149), which are pieces of bread stuffed liberally with cheese and in this case, a non-vegetarian filling of chicken sausage pieces. This was followed by a quick tasting of the wide array of Sbarro’s pastas (priced at Rs. 159, and Rs. 179) which are traditionally served with a piece of garlic bread. The saucy sausage pasta was a brilliant gastronomic experience, with light, natural tomato flavours that will make your taste buds reach cloud nine with its sausage pieces of chicken ham dipped in tangy red spaghetti. I also had the arrabiata pasta, which in a surprising but flavourful take, had pieces of corn within the whole dish. Among the white sauce types of pastas, the alfredo parmesan was a wonderful pick, with liberal amounts of dairy cheese and mushrooms that will knock one right off their seats. Among the beverages, I tasted both the orange and cucumber lemonades (both priced at Rs. 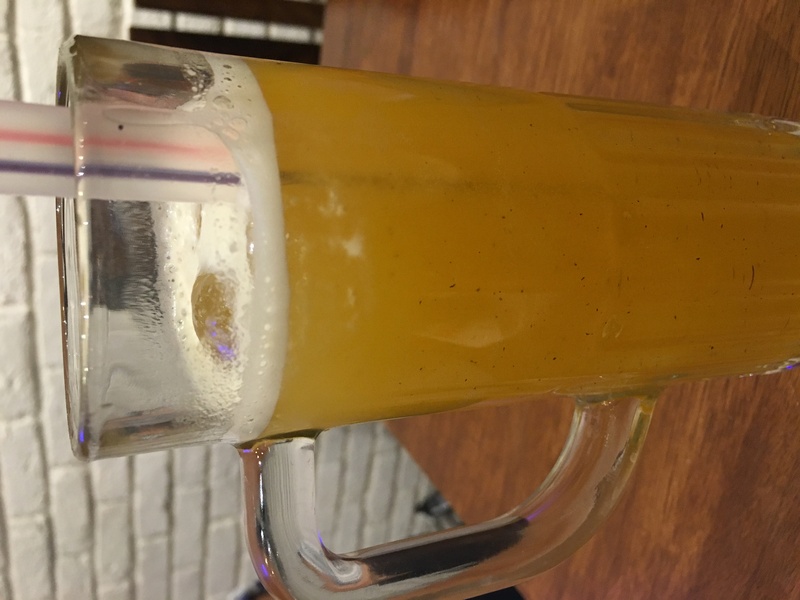 50), each with a refreshing and unique flavour of its own, with the former having a tangy, tantalizing, and sweet taste to it, and the latter having an offbeat, relaxed taste, which would prove to be a hit in the harsh Delhi summer months. The dessert menu was otherworldly, with three dishes to satisfy your sweet tooth. The New York cheesecake was firm, filling, and made with Philadelphia cream cheese. The frosted carrot cake was something to be truly relished, consisting of a soft pastry with a hint of cinnamon and a sizeable frosting of cream cheese. The fudge nut brownies were served hot, and with a dash of hot chocolate sauce, and melted right in the mouth. Apart from the food, the other best parts of eating at Sbarro were its ambience and its open air kitchen in full view of every customer. With a minimalist theme in black, red, green, and white colours, Sbarro has a setting that will not bear down on you, but only serve to give you the Italian rustic feeling when you sit down to eat. Another bonus point to this outlet was its fire safety standardizations, with many extinguishers and pipelines located at different strategic points in the restaurant area, which is exceptional to find in a restaurant. Sbarro plans to expand to home delivery soon, as it is expecting a huge turnout in its Connaught Place outlet, as it is in a prime location in the heart of the city. However, I highly recommend everyone to visit Sbarro soon, and have an unforgettable time eating out your favourite Italian dishes. 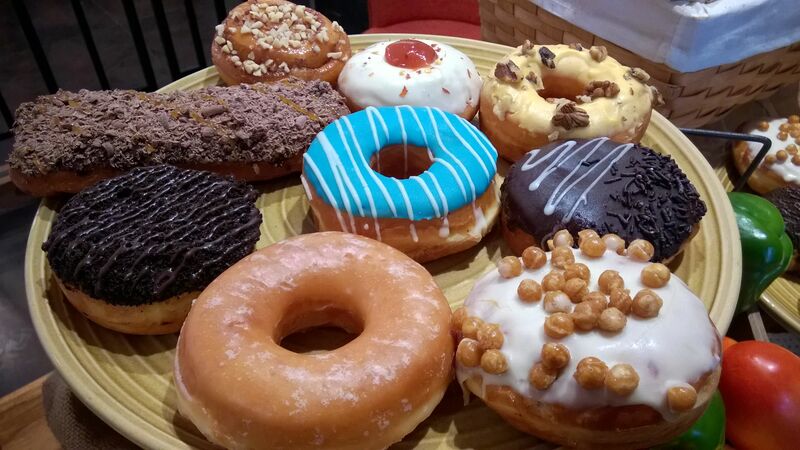 Come 10th of December and the CP outlet of much loved Dunkin’ Donuts will throw open its doors to customers with an all new revamped menu and renovated decor at their store. Most of the redesigning has been done keeping in mind the ‘young evolved consumer with the mental age of around 25’. DD attempts to reflect the struggles, complexes, comforts and celebrations of today’s youth in its food and does that quite successfully to an extent! The classic donuts get a twist this season and come with unusual flavours like chilli guava and peppermint. The chilli guava flavour, named ‘It’s a mistake’, doesn’t seem to be much of a mistake but a tasteful invention. A white chocolate layer with red guava compote and sprinkled with red chilli flakes that leave an aftertaste seems to be a weird combination but it is a must try! We can place our bets on it becoming the hot favourite of the town in a few days! While DD has always been famous for its burgers, they now have the ‘Naughty Lucy Burger’ for us with white cheddar cheese oozing out from its patty and the ‘Tough Guy Burger’ that comes with the chewy Bagel bread, hint of kasundi mustard, veggies, chicken salami and patty. DD has also come up with something amazing for the Indian palate- the much adored masala cha in the iced tea version! Yes, they have on their menu, the ‘Spiked Iced Tea’ which is infused with cloves, cinnamon, star anise and cardamom and tastes fabulous. It is definitely a must have for all tea lovers. Meanwhile, the iced green tea is a bit of a letdown and classic lemon iced tea is just regular, with perhaps a stronger hint of actual ‘tea’ in it. DD also brings to us the ‘Wicked Wrap’ which, mind you, is very, very hot. It comes with spicy chicken, veggies, jalapenos and surprisingly, nachos inside it. 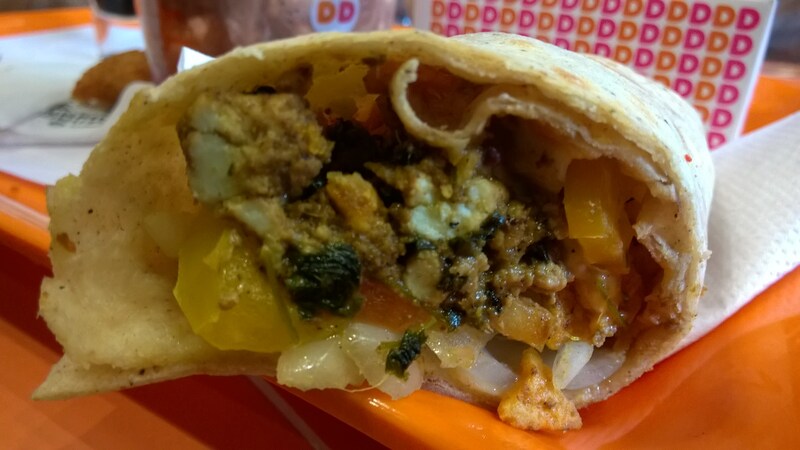 It also has a green mango relish which tastes perfect to Indians of course, but overall the wrap may seem a bit dry. They also have the ‘Not-so-Wicked’ wrap which is for the faint-hearted (read: cannot stand chillies). When talking of Dunkin Donuts, how can we leave coffee behind! The new ‘Dunkaccino’ the cold coffee at DD, comes with Jamaican rum flavouring and almonds. It is a decent tasting coffee while many people might not appreciate almonds in it. The ‘Stirr’accino’, a new invention by the DD chefs, is a true coffee lover’s delight. 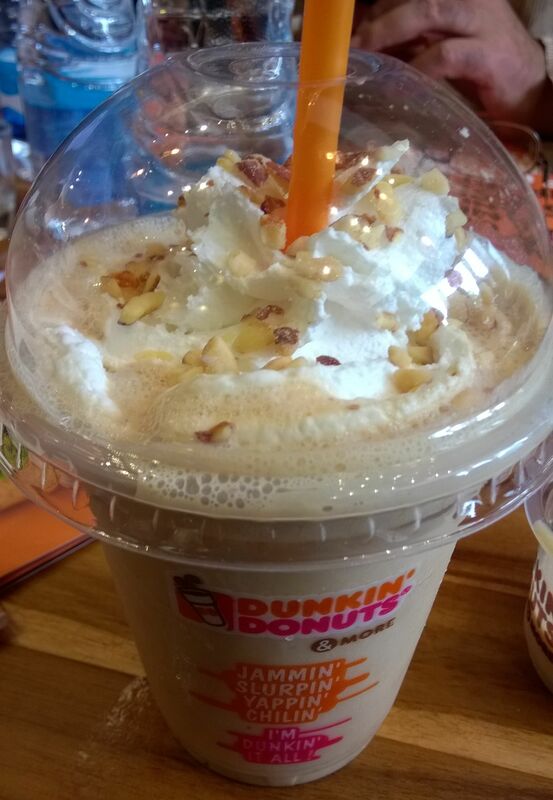 It is strong and aromatic, and the coffee comes with suspended layers of Dunkin Original and Dunkin Espresso which looks s beautiful as it tastes. 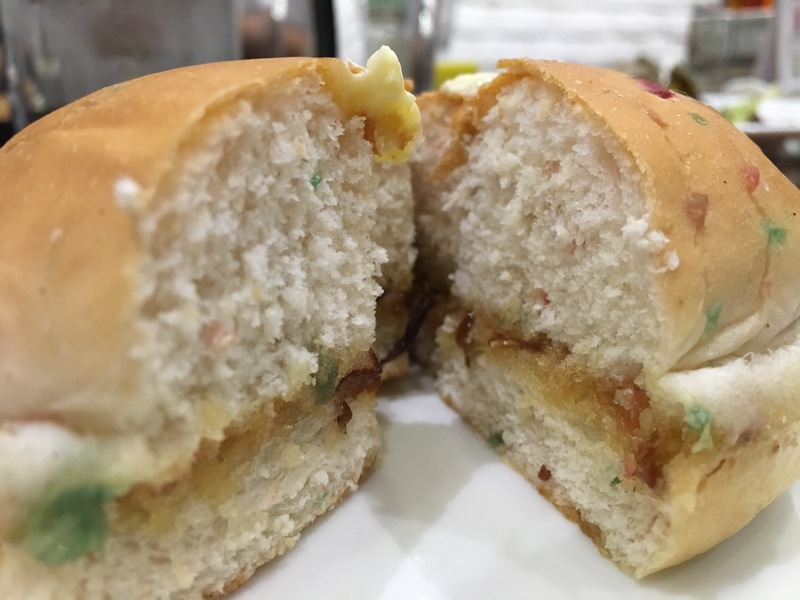 All in all, the revamped menu at Dunkin Donuts is a must try! And hey, did you hear about the early bird freebies you can get if you visit the CP store early morning on 13th of this month? There’s a lot on stake, make sure you get your share of gifts! I still remember an article titled “The Year That Was” written by Rahul Verma in The Hindu, the only food writer in India whom I follow religiously, and who mentioned in his last article of 2013 about his most memorable meals of the year. One of them was in Monkey Bar. Indeed, it turned out to be one of my most memorable meals of 2014. Monkey Bar. 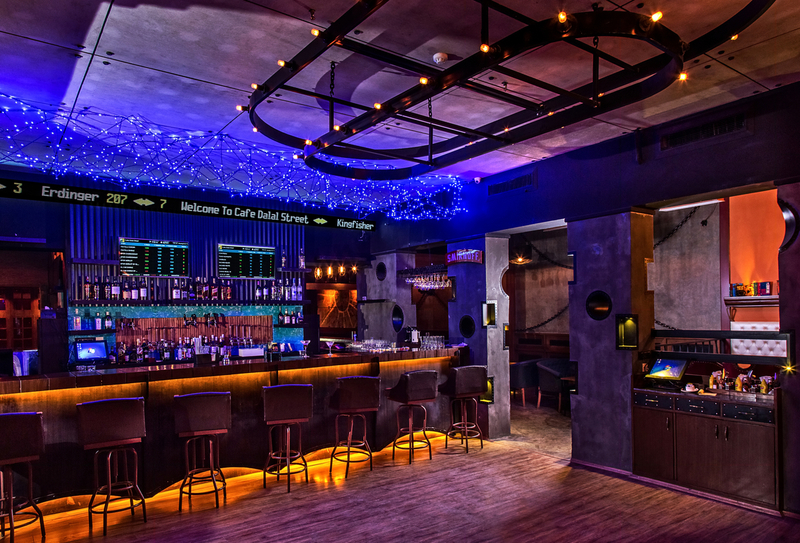 or Mobar, a gastropub, opened their second branch in Connaught Place this year, located at 3, Connaught Circus, Connaught Lane, above Uttam Sarees shop. 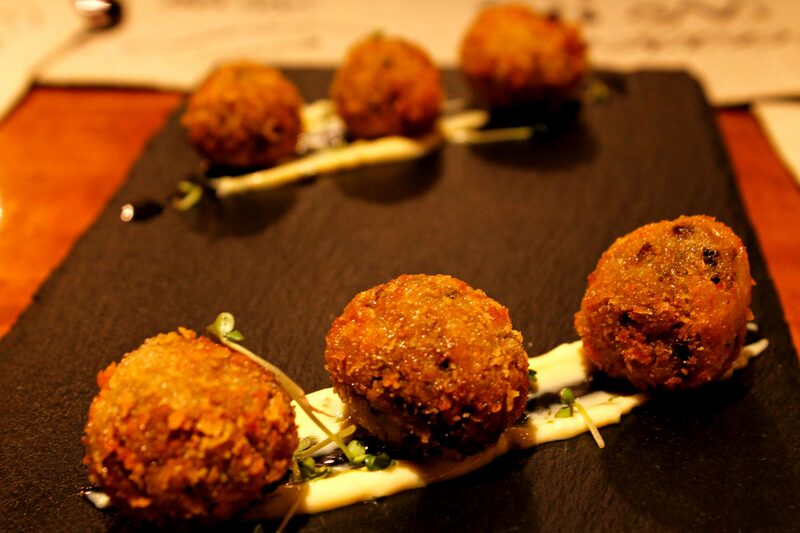 The dishes have been curated by one of India’s most promising young chef and entrepreneur. Manu Chandra. 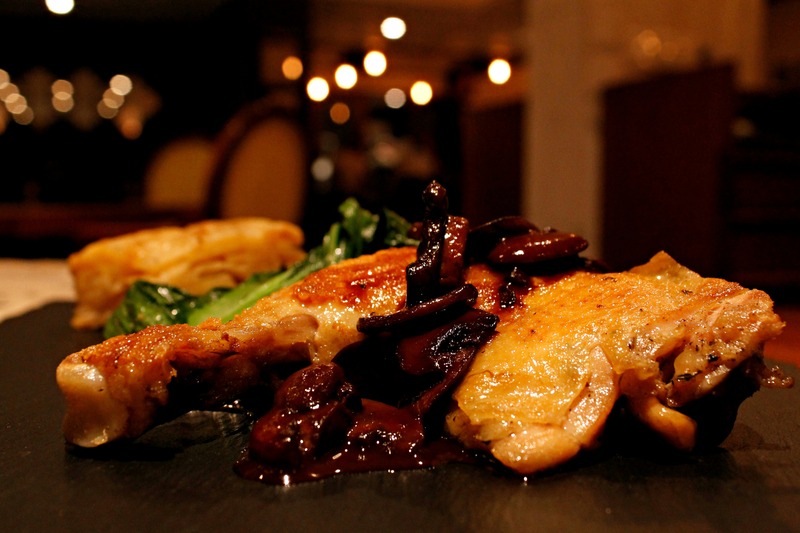 I had no doubt about the food as I had read extensive reviews before visiting the Mobar. Ankit, a trained chef and the restaurant manager at Monkey Bar CP, introduced the dishes one by one to me comprehensively. With deep research about the nearby restaurants and bars in Connaught Place, these fusions have been curated to suit the palate of every customer. On Ankit’s recommendation, I started with ricotta and paneer kebab, served with grilled pav and tomato kalonji chutney. Next was keema bao, a freshly steamed bao of rice, stuffed with spicy minced mutton and served with rich mutton broth in a small glass topped with coriander. The keema bao broth is perfect for Delhi winters. I can imagine myself having mutton broth on the terrace of Mobar to keep myself warm, when the temperature will dip further in the coming winter months. Dabeli, a Gujarati snack is served with tamarind and masala flavoured potato in fresh pav coated with sev, heeng peanuts, pomegranate, fig, tamarind, and garlic chutney. The two starters, which I am sure would be loved by Delhiites are chilli cheese dragons – spring rolls filled with cream cheese and mozzarella, green chilli, capsicum, coriander, onion and served with roasted garlic chilli dip; and butterfly chicken, which consists of sweet, spicy, crispy bits of chicken tossed with sesame, chilli, honey and peppers, stuffed in Mobar’s signature butterfly shells. In the main course, I had Chandra Ji’s mutton curry. This dish is named after the chef’s father, Mr. Chandra. 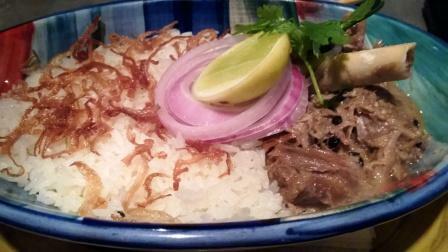 The succulent lamb is cooked with khada masala, curd, butter, and served with steamed rice topped with caramelized onions. This was my kind of mutton, which I normally cook at my home with raw spices. The aroma of the spices is intact and can be felt while eating. The most interesting dish I had at Mobar was butter chicken khichdi. It sounds really unusual to mix khichdi with butter chicken, and the dish while being offbeat, was truly delectable. The softness of creamy moong dal khichdi with succulent pieces of chicken served with “khichdi ke paanch yaar” – ghee, papad, dahi, salad and achaar, was a great gastronomical experience. I added a spoon of ghee, crushed papad, mixed dahi, and salad to make a perfect mix of khichdi and butter chicken. It was indeed divine. I was also served patra ni machi, a classic Parsi dish with a Bengali twist, basa topped with green chutney and kashundi, steamed in banana leaves, and served with steamed rice. However, it was too salty for me. I ended my journey with filter coffee panna cotta, cardamom and milk cake crumble with salted caramel sauce and coffee ice cream. I am sure this would have been inspired from the next door restaurant, Sarvanaa Bhavan’s filter coffee. As the year 2014 is coming to an end next month, I am already eagerly waiting for Rahul Verma’s list of memorable food trips of 2014, so that I can relish throughout the year.